CBSE open school admission is another option for students to study privately from CBSE Open Board without regular schooling. Taking This way the students can appear in CBSE BOARD exams with all the regular CBSE school students. All class 10th or 12th students shall appear in same exam at the same time with school students. Also the results are declared on the same day with all regular school students of all India. Therefore there is no difference in certificates passed by a student from regular school or by a student via CBSE OPEN BOARD. 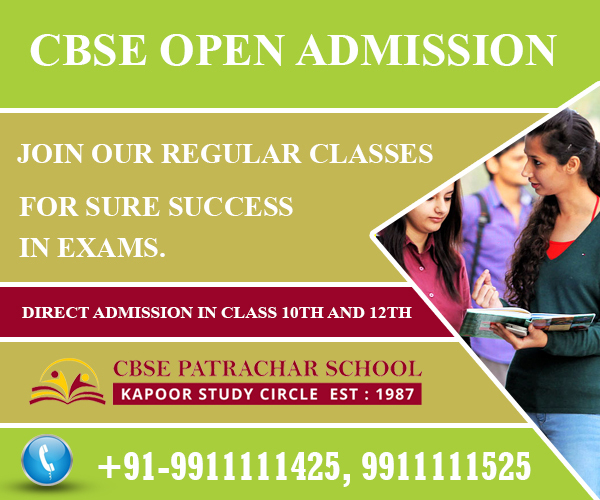 CBSE Open School Delhi under Patrachar School in Delhi is the best CBSE Open School for CBSE Open where students can get all about CBSE Open school Admission information for class 10th and class 12th. Also CBSE Patrachar School Provides coaching classes for CBSE OPEN BOARD Students. CBSE OPEN SCHOOL in Delhi – Eligibility for Admission class 10th 12th. Generally if you are a regular school student than you can apply via your school for CBSE BOARD final exam for class 10th or class 12th. But if you have left the school due to either fail in school final exams or were school dropout than you can apply for CBSE OPEN SCHOOL admission form class 10th or class 12th. (A) 9th fail students can take direct admission in class 10th from CBSE OPEN SCHOOL. (B) 11th fail students can also take direct admission in class 12th from CBSE OPEN SCHOOL in all the streams Arts, Commerce or Science. (C) 10th passed students with one year gap can also register them self for class 12th admission from CBSE OPEN SCHOOL. 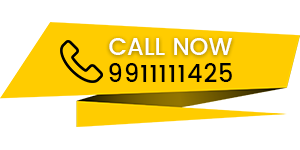 If you want any help or guidance for your admission in class 10th or class 12th via CBSE OPEN than you can contact us at our helpline numbers – 9911111425, 9911111525 or visit our coaching centers for more information. 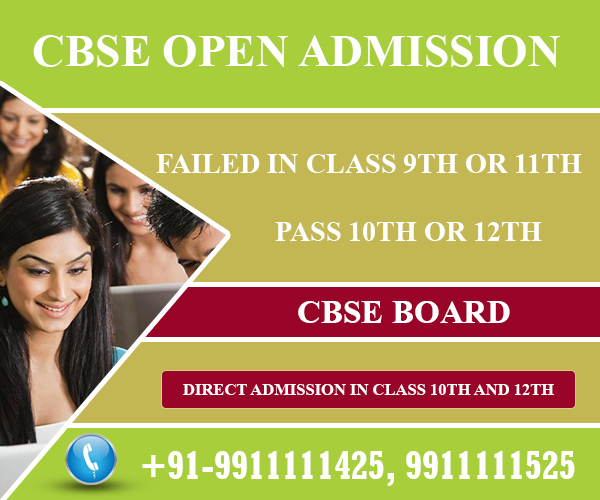 CBSE OPEN SCHOOL, CBSE OPEN BOARD ADMISSION is a life line for school fail & dropout students. Passing the school board examinations of class 10th and 12th is the invariable dream of all school-going students. Right from their early age, they learn from their elders in the family that if they want social recognition, they must get good education and settle down in life with lucrative careers. The schooling system of India is set-up on the premise that Boards of Education in all the states are running regular schools, under their care and control. In these regular schools, students failing in 9th class cannot go to 10th class; those who fail in 11th class can’t join 12th class. These students have to repeat the same class as a result their one precious year is lost. They are given transfer certificate and sent out. They can’t appear for the CBSE BOARD Public exams conducted for 10th class and 12th class again from school. CBSE open school admission is a boon for these students. Now these students can also apply directly for class 10th or class 12th and can appear for CBSE BOARD exams. CBSE PATRACHAR SCHOOL can make this CBSE open admission available for you and help you get pass in your board exams! How CBSE PATRACHAR SCHOOL helps to Complete Delhi Open School Registration 2019? CBSE PATRACHAR SCHOOL has been serving the student community for the last 25 years and more. Thousands of students have become successful in passing 10th standard and 12th standard through CBSE open admission. The expert professionals guide the students interested for admission in every way – from filling up the CBSE open admission form, guiding the students about the procedures, formalities and supporting documents required etc. to fulfill the stipulated conditions. In our study centers, CBSE PATRACHAR SCHOOL expert teachers conduct special coaching classes. Students can choose morning classes, evening classes or week-end classes, as per their convenience. The learning process of CBSE 10th standard and 12th standard CBSE subjects is conducted with modern equipment’s, in comfortable class-rooms; well-prepared guides, study materials, previous question papers and answers are provided to the students. The extensive experience in coaching classes for 10th class and 12th class for years puts the teaching of CBSE PATRACHAR SCHOOL in good stead. The fear or inhibition in revealing their weakness in any subject is removed totally. In that place, extreme self-confidence is instilled to acquire exhaustive knowledge and skill in failed subjects. For the above mentioned reasons, if you join CBSE Open Admission through CBSE PATRACHAR SCHOOL , you are assured of passing out with high marks in 10th standard and 12th standard. IMPORTANT DATES, LAST DATE FOR CBSE OPEN ADMISSION IN CLASS 10th & 12th. DOCUMENTS REQUIRED FOR CBSE open ADMISSION FOR CLASS 10TH . 31st March in the year in which you want to take admission.